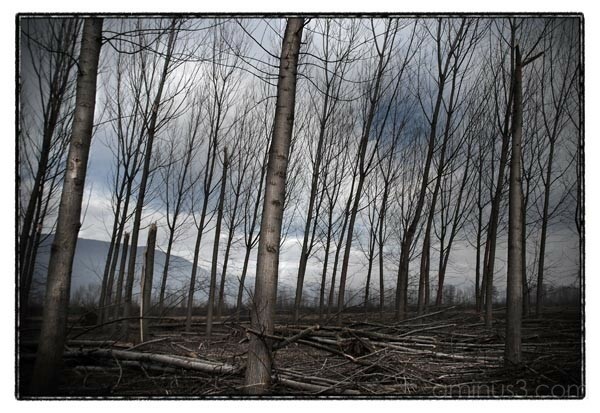 yiannis krikis (thessaloniki, Greece) on 1 April 2008 in Landscape & Rural and Portfolio. nice composition and great colors! Love the silvery-blues throughout, and the slight angle at which all the trees are leaning. Well seen and well composed. La forêt enchantée, Wow it's superb! I agree with GJC - likle the way the trees are leaning or reaching :) Like the movement and color. I like the lean of the trees. Very nice processing. neat capture and processing. why are the trees all slanted though? is the wind always blowing in a certain direction or something? It has a very eiry feeling. Very nice image. There is just something about the way you capture the colors that makes your images different. It may be the emphasis on blues but, no, it is more than that. Whatever, very pleasing. Looks like what we call "clear cutting". Nice tones and great atmosphere here, very well done! Nice picture for a desolated place ! The tones are awesome accentuating the leaning lines made by the trees. A classic yiannis image... Excellent!! The tones and composition are perfect. A truly excellent image. Beautiful lines and very tasteful processing.